The psoas major (/ˈsoʊ.əs/ or /ˈsoʊ.æs/) (from Greek: ψόας – psóās: 'of the loins', genitive singular form of ψόα – psóa 'the loins') is a long fusiform muscle located on the side of the lumbar region of the vertebral column and brim of the lesser pelvis. It joins the iliacus muscle to form the iliopsoas. The psoas major is divided into a superficial and deep part. The deep part originates from the transverse processes of lumbar vertebrae I-V. The superficial part originates from the lateral surfaces of the last thoracic vertebra, lumbar vertebrae I-IV, and from the neighboring intervertebral discs. The lumbar plexus lies between the two layers. The iliacus and psoas major form the iliopsoas, which is surrounded by the iliac fascia. The iliopsoas runs across the iliopubic eminence through the muscular lacuna to its insertion on the lesser trochanter of the femur. The iliopectineal bursa separates the tendon of the iliopsoas muscle from the external surface of the hip joint capsule at the level of the iliopubic eminence. The iliac subtendinous bursa lies between the lesser trochanter and the attachment of the iliopsoas. Innervation of the psoas major is through the anterior rami of L1 to L3 nerves. In less than 50 percent of human subjects, the psoas major is accompanied by the psoas minor. In mice, it is mostly a fast-twitching, type II muscle, while in human it combines slow and fast-twitching fibers. This muscle is equivalent to the tenderloin. The psoas major joins the upper body and the lower body, the axial to the appendicular skeleton, the inside to the outside, and the back to the front. As part of the iliopsoas, psoas major contributes to flexion in the hip joint. On the lumbar spine, unilateral contraction bends the trunk laterally, while bilateral contraction raises the trunk from its supine position. In addition, attachment to the lesser trochanter, located on the postero-medial aspect of the femur, causes lateral rotation and weak adduction of the hip. For example, when doing a sit-up that brings the torso (including the lower back) away from the ground and towards the front of the leg, the hip flexors (including the iliopsoas) will flex the spine upon the pelvis. Owing to the frontal attachment on the vertebrae, rotation of the spine will stretch the psoas. The psoas lies postero-lateral to the lumbar sympathetic ganglia, and the needle tip will often pass through the psoas major for a lumbar sympathetic block. Tightness of the psoas can result in spasms or lower back pain by compressing the lumbar discs. A hypertonic and inflamed psoas can lead to irritation and entrapment of the ilioinguinal and the iliohypogastric nerves, resulting in a sensation of heat or water running down the front of the thigh. Psoas can be palpated with active flexion of the hip. A positive psoas contracture test and pain with palpation reported by the patient indicate clinical significance. Care should be taken around the abdominal organs, especially the colon when palpating deeply. The appearance of a protruding belly can visually indicate a hypertonic psoas, which pulls the spine forward while pushing the abdominal contents outward. One study using autopsy data found that this muscle is substantially thicker in men of African descent than in Caucasian men, and that the occurrence of the psoas minor is also ethnically variant, being present in most of the white subjects and absent in most of the black subjects. ^ Bojsen-Møller, Finn; Simonsen, Erik B.; Tranum-Jensen, Jørgen (2001). Bevægeapparatets anatomi [Anatomy of the Locomotive Apparatus] (in Danish) (12th ed.). pp. 261–266. ISBN 978-87-628-0307-7. ^ Nunes, MT; Bianco, AC; Migala, A; Agostini, B; Hasselbach, W (1985). "Thyroxine induced transformation in sarcoplasmic reticulum of rabbit soleus and psoas muscles". Zeitschrift für Naturforschung C. 40 (9–10): 726–34. PMID 2934902. ^ Arbanas, Juraj; Starcevic Klasan, Gordana; Nikolic, Marina; Jerkovic, Romana; Miljanovic, Ivo; Malnar, Daniela (2009). "Fibre type composition of the human psoas major muscle with regard to the level of its origin". Journal of Anatomy. 215 (6): 636–41. doi:10.1111/j.1469-7580.2009.01155.x. PMC 2796786. PMID 19930517. ^ Earls, J., Myers, T (2010). Fascial Release for Structural Balance. Chchester, England: Lotus Publishing. p. 130. ISBN 9781905367184. ^ Corbo, & Splittberger (2007). Your Body, Your Responsibility. Arizona: Wheatmark Inc, Amazon. p. 88. ^ Hanson, P.; Magnusson, S. P.; Sorensen, H.; Simonsen, E. B. (1999). "Anatomical differences in the psoas muscles in young black and white men". Journal of Anatomy. 194 (Pt 2): 303–307. doi:10.1046/j.1469-7580.1999.19420303.x. PMC 1467925. Akuthota, Venu; Ferreiro, Andrea; Moore, Tamara; Fredericson, Michael (2008). "Core Stability Exercise Principles" (PDF). Current Sports Medicine Reports. American College of Sports Medicine. 7 (1): 39–44. doi:10.1097/01.CSMR.0000308663.13278.69. PMID 18296944. Retrieved 26 March 2011. Position of psoas major muscle. Animation. Hip bones are shown in semi-transparent. 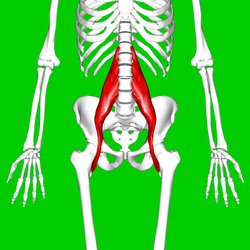 Wikimedia Commons has media related to Psoas major muscles.